The bulk of Mera, officially the highest of Nepal’s permitted trekking peaks, rise to the south of Mt. Everest and dominates the watershed between the wild and heavily wooded valleys of Hinku and Hongu Drangkas and is not truly speaking part of the Khumbu Himal. From the Peak base camp Mera La 5300m. truly see a mountains wilderness, a place of massive moraines, glacial lakes and spectacular peaks that include Mt. Makalu 8463m., Chhamlang 7200m. Baruntse 7230m. Mt. Everest, Lhotse, far away Mt. Kanchanjunga 8585m. and other more mountains, Himalaya range. If you climb more high up to Mera high Camp and up to Peak summit, then more beautiful unexpected all of scenery Nepal eastern part of Himalaya panoramic views. 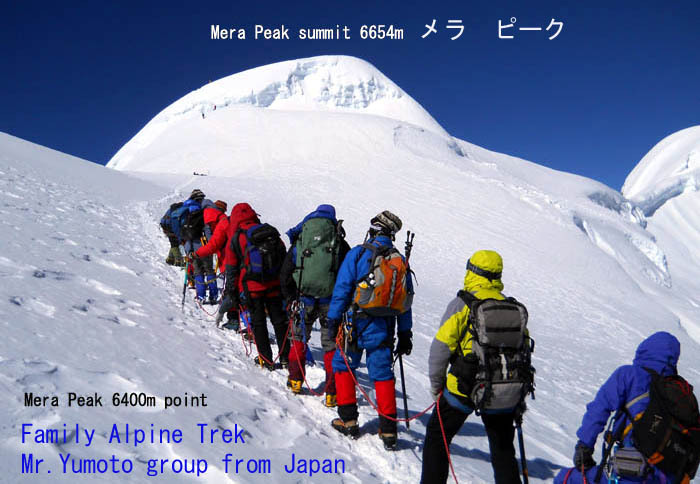 Mera peak is the highest trekking peak but easier to climb than other mountains. It is not so steep climbing route and no dangerous of icefall. ( There are 2 routes for Mera peak trekking, Short cut high route from Zatra La & Lower route from Payu ) The following is long route itinerary.